Campbell drove, Anderson sat in the passenger seat, and the rest of the crew and all the equipment squished into the back. As the used 2006 Jeep Liberty drove closer to the city, a sadness grew over Anderson. He was thinking about his mother, Joan, the woman who raised him and taught him to be the man he is today. Anderson’s realness and emotion is on full display throughout Mr. Chibbs, the documentary showcasing the success and struggles of the basketball star in theaters May 3. Campbell was first introduced to Anderson by Dr. Michael J. Brunetti, who used to work with the New York Knicks. Campbell was hooked as soon as she heard his story. Anderson, nicknamed Mr. Chibbs by his mother, began garnering attention and headlines when he was in middle school. College recruiters began courting him in sixth grade. He was a four-time Parade All-American at Archbishop Molloy High School in Briarwood, Queens, and was considered one of the top prospects in the country. 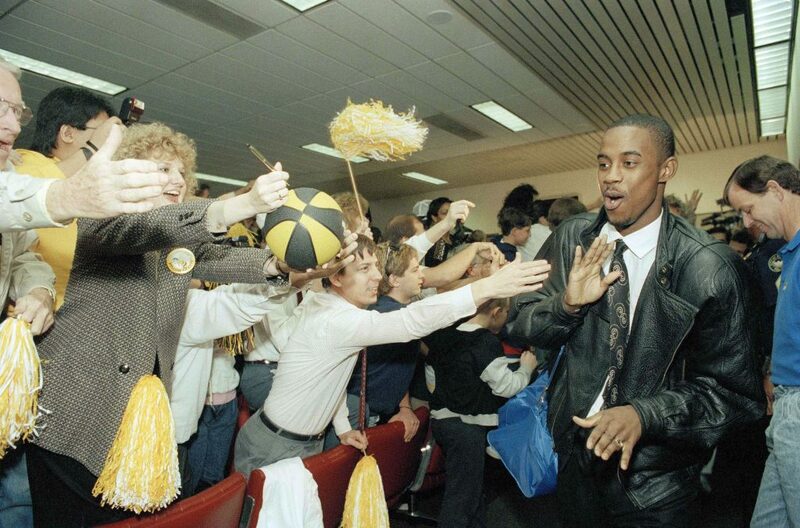 Anderson played two seasons at Georgia Tech, leading the Hornets to the 1990 Final Four, losing to eventual champion UNLV. He was drafted No. 2 overall by the New Jersey Nets in the 1991 NBA Draft and played 14 seasons in the league. Anderson was named an NBA All-Star in 1994. It was after his basketball career when Anderson felt lost. He wasn’t sure what to do, especially after his mother died of a heart attack in October 2005. He also filed for bankruptcy despite making $63 million from his playing career. In May 2013, Anderson was arrested for driving under the influence, and lost his job as basketball coach at David Posnack Jewish Day School in Davie, Fla., as a result. During this torrid time in his life he also admitted he was sexually abused as a child. Campbell and her crew spent nearly three years on and off filming Anderson’s life, whether he was going to see a number of the eight children he’s fathered from five women, coaching basketball, attending speaking engagements or returning to old influential locations from his life. Anderson, like that ride from JFK Airport, didn’t sugarcoat his emotions or mince his words at any point. Like Anderson’s life, telling his story wasn’t smooth sailing either, especially due to a lack of funding, but up stepped executive producer Barry Greenstein to keep the project intact. Campbell said everyone involved with the film was passionate about the project whether they were fans of Anderson’s or understood the importance of sharing his story. Anderson said watching the documentary was somewhat therapeutic for him readdressing the things he’s gone through in his life. Campbell hopes other viewers of the film can relate to Anderson’s personal story and growth.